Lock in a great price for Holiday Inn Express Dunstable – rated 8.5 by recent guests! I go to Dunstable quarterly and i like this particular Hotel for it's location, cleanliness and staff. For what you get it's normally very reasonable priced and you get a free breakfast. My first choice for Dunstable. The room was spot on after cleaning and even my clothes was carefully folded! Excellent shower - spacious walk-in shower with ample and constant water pressure. Why can't all hotels be like this? Front desk staff were very helpful and efficient. Breakfast was excelllent. 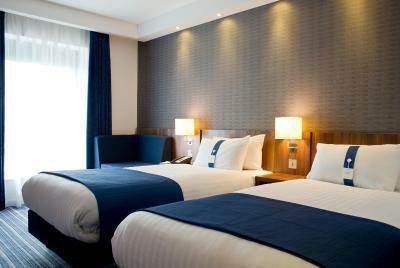 Holiday Inn Express Dunstable This rating is a reflection of how the property compares to the industry standard when it comes to price, facilities and services available. It's based on a self-evaluation by the property. Use this rating to help choose your stay! Offering free parking and free Wi-Fi just off the A5 road, Holiday Inn Express Dunstable is 10 minutes’ drive from the M1 motorway with spacious, modern rooms. There is an on-site restaurant, and London Luton Airport is 15 minutes away by car. Bright and stylish, every room at Holiday Inn Express Dunstable features an private bathroom with power shower and a hairdryer. You can relax with Freeview TV in the room, or make use of the work desk. The on-site bar serves drinks in relaxed surroundings, while breakfast and evening dining can be enjoyed in the hotel’s Great Room Restaurant. London Luton Airport is only 7 miles from the hotel, while Whipsnade and its golf club are 10 minutes away by car. Woburn is a 15-minute drive away, and Milton Keynes is 20 minutes’ drive away. This property is also rated for the best value in Dunstable! Guests are getting more for their money when compared to other properties in this city. When would you like to stay at Holiday Inn Express Dunstable? an emergency pull cord and emergency call point adjacent to the bed. Also includes a lowered spy hole and light switches for easy access, and vibrating pillows, triggered in the event of a fire alarm. Bright and modern room featuring an private bathroom with a power shower and hairdryer, free Wi-Fi, a TV with Freeview channels, and a work desk. Features include satellite TV, and private bathroom, and tea and coffee making facilities. House Rules Holiday Inn Express Dunstable takes special requests – add in the next step! Holiday Inn Express Dunstable accepts these cards and reserves the right to temporarily hold an amount prior to arrival. Cleanliness of room. Air con didn't work. Window didn't stay open. The shower didn't drain. General noise from outside in the corridor from other residents. Very loud doors that slammed shut. Breakfast was good. Check in and out was swift. Location was good. Clean, convenient for airport. Staff first class. Cannot fault our stay. Kirstie was amazing. The hotel is beautiful. However we can't control the thermostat in our room. The temperature was set at 24.5 c degree at night, which is too hot for us to sleep at night. Very good value for money and breakfast was included. Beautiful and large room. Not too far to go to town centre. The noise from other customers. Particularly upstairs from our room. Disabled parking taken by work vans. Very wrong. Lovely room and bathroom. Very clean staff were great. our stay was on a Sunday a night ,found a thai restaurant close by called the Lumpini that did a wonderful all you could eat buffet. the place was very busy so do book. Housekeeping hoovering the corridor way to early on a Sunday morning, was looking forward to a lie in. Very comfy bed and clean room. The toaster in the dining area was very slow and had a constant queue. I wanted to pay cash to settle my bill. I found it very strange that the staff requested a £100 deposit for me to settle a £50 room bill. I paid by card in the end but would have preferred to pay cash. The breakfast was basic but tasty.